Tomodachi Summer Teen Program The Summer Teen Group program provides middle school aged youth with fun and challenging experiences to support their personal growth. The teens participate in recreational activities, including camping, amusement parks and water slides. Participants will also develop their leadership skills by assisting Tomodachi Summer Program Youth Leaders and attending personal development workshops. To apply for the Tomodachi Summer Teen Program, please complete the online application here. 2019 Program Dates: June 10th - August 9th *Program will be closed on Thursday, July 4th Hours of Operation: Monday through Friday 7:30 a.m. to 6:00 p.m. (*Program activities begin at 9:00 a.m. and conclude at approximately 3:30 p.m.) Tomodachi Summer Program The Tomodachi Summer Program provides children entering Kindergarten through sixth grade with the opportunity to build new friendships and cultivate new interests. Tomodachi is a 9-week, full day program, which offers children interest-based club options, field trips and cultural enrichment activities. The 2019 Tomodachi Summer Program is FULL for most grades/weeks. Please call for specific availability. Tomodachi Summer & Teen Program 1840 Sutter Street, Suite 207 San Francisco, CA 94115 For more information, contact Erika Tamura. Phone: (415) 563-8052 Fax: (415) 921-1841 Email: tomodachi@jcyc.org Website: www.tomodachiprogram.org 2019 Program Dates: June 10th - August 9th *Program will be closed on Thursday, July 4th Hours of Operation: Monday through Friday 7:30 a.m. to 6:00 p.m. (*Program activities begin at 9:00 a.m. and conclude at approximately 3:30 p.m.) Tomodachi Summer Program The Tomodachi Summer Program provides children entering Kindergarten through sixth grade with the opportunity to build new friendships and cultivate new interests. Tomodachi is a 9-week, full day program, which offers children interest-based club options, field trips and cultural enrichment activities. 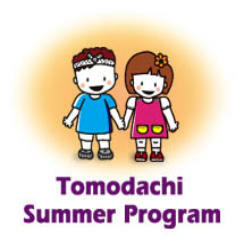 The 2019 Tomodachi Summer Program is FULL for most grades/weeks. Please call for specific availability. Tomodachi Summer Teen Program The Summer Teen Group program provides middle school aged youth with fun and challenging experiences to support their personal growth. The teens participate in recreational activities, including camping, amusement parks and water slides. Participants will also develop their leadership skills by assisting Tomodachi Summer Program Youth Leaders and attending personal development workshops. To apply for the Tomodachi Summer Teen Program, please complete the online application here.